The Labor government have done everything they can to construct hell on earth on Nauru. But they did not count on the brave and determined resistance by asylum seekers detained there that has already thrown their Pacific Solution into crisis. Every day, the near-400 asylum seekers on Nauru are protesting, demonstrating and leaking out information through their Facebook page and through phone calls to refugee activists. As we go to print 300 are on, in their words, “unlimited hunger strike, until we are getting our rights.” They are making three central demands: “Close the Nauru detention centre; 2) Take us back to Australia; 3) Start processing our cases.” It is one of the largest hunger strikes in detention history. It took up to 18 months for such explosive protests to begin on Nauru under the Howard government. Their emergence so early on this time is the result of the government’s strategy of making the conditions in the camp as unbearable as possible. It has become even clearer that the Labor government’s policy is offshore dumping, not processing. Three days into the hunger strike, after finally agreeing to meet with the asylum seekers, the Immigration Department trotted out their line: the asylum seekers would be waiting at least six months for their processing to begin—under “Nauruan law”—and Australia would be just “one of 22 possible resettlement countries”. This is absolutely ridiculous. Nauru does not yet even have any laws for processing asylum seekers. And with the United Nations High Commission for Refugees refusing to be involved, there is no way to other resettlement countries will get on board. For all the talk that asylum seekers would be “free to roam” Nauru, the camp is fenced in and excursions are currently off limits. So much for Angus Houston’s claim that Nauru this time would have “much better conditions for people to live in”. Instead, just like last time, the deliberate cruelty and threat of a hopeless future is being used to force people onto planes back to where they came from. The Immigration Department have tried to crack down on organising inside the camp, cutting access to the internet to half an hour every two days. Meanwhile Chris Bowen has shown yet again he can go lower and lower, announcing in yet another backflip that Labor will go ahead with the absurd policy of excising the entire Australian mainland from the migration zone (just in case any asylum seekers try to avoid Nauru by sailing to the mainland). But Labor’s “solution” is in tatters. They will not be able to stem the tide of the protests—or stop the boats. Nauru has failed as a “deterrent”. Over 6000 people have arrived since the policy was implemented on August 13. This is enough to fill Nauru at its projected maximum capacity of 1500, and Manus Island, with a projected capacity of 500, three times over. (And this capacity is a long way off, with no more construction started on Nauru and the Immigration Department postponing Manus’ opening past the original end of October deadline). 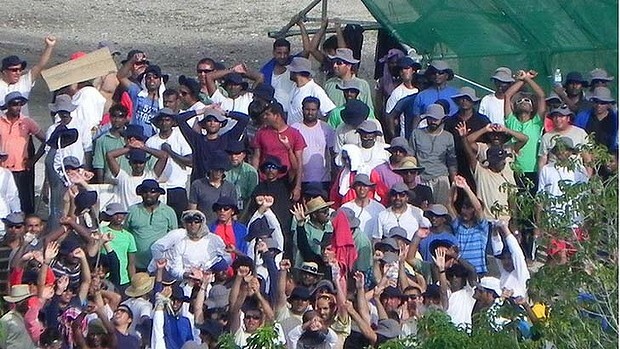 These 6000 asylum seekers are now languishing in detention centres on Christmas Island and Darwin, with the Immigration Department refusing to begin their refugee claim process. It is only a matter of time before the same protests and self-harm that we are seeing on Nauru begins here too. The horror on Nauru is already capturing international attention and arming the refugee campaign with expose after expose. The Immigration Department is on the defensive. As these cracks begin to emerge, it is our job to split them open. The October rallies across the country were the campaign’s first kick at the policy, now being followed up with solidarity actions in support of the hunger strikers. Every bit of solidarity counts—and can provide sustenance and strength to the asylum seekers who are the victims of the parliamentary race to the bottom. The asylum seekers on Nauru have released a statement as we go to press, “requesting… the people of Australia to make voice for the humanity and us to save our lives and future”.